It is business as usual for Redland City Council’s kerbside recycling collection service with yellow-topped recycling bins continuing to be collected fortnightly from every Redland residence. Redland City Mayor Karen Williams said Council has just renegotiated a two-year extension (until June 2020) with Visy, the supplier that sorts, processes or recycles the city’s recyclable materials. “It is important that Redland Residents continue their efforts to sort their household recyclables so their yellow-topped bin is as free from contaminants as possible. Recycling correctly ensures the city has a premium product that can be properly recycled into new products,” Cr Williams said. “I urge everyone to be part of the solution – continue to recycle and recycle well. In the Redlands, the average contamination rate for yellow-topped recycling bins remains steady at around 7 per cent, due in part to Council’s sustained and ongoing education campaigns about recycling behaviour, waste minimisation and sustainable living. “Councils with unacceptably high recycling contamination levels are now facing prohibitive processing costs, following market impacts caused by China’s National Sword Policy. “Redlands is not in that position, nor do we want to be. Our best course of action is to band together as a community to recycle right, keeping our product clean and saleable,” Cr Williams said. The only materials your recycling bin loves are firm plastics, steel and aluminum cans, glass, paper and cardboard. The most common contaminants we find are plastic bags, clothing, nappies, styrofoam, food waste and garden waste. Please do your part by keeping these, along with excess general waste, out of your recycling bin. Excess general waste can be either held over for the next weekly kerbside general waste collection or taken to a waste transfer station free of charge. 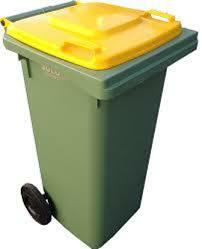 Council also provides an optional kerbside green waste bin for garden organics.